Africa's development challenges will continue to be a major focus of global attention in 2007. The recent statement by the new United Nations secretary general, Ban Ki-moon, that Africa will be a major focus of his work has already set the tone. The new director general of the World Health Organization (W.H.O. ), Margaret Chan, is also on record as indicating that Africa will be a principal focus of her tenure. Paul Wolfowitz, the president of the World Bank, has made speeches recently on the need for a strong international response to development challenges in Africa. Germany, as the current leader of the Group of 8 meetings, will also focus on Africa's development issues. However, despite the strong show of support by the global community, the continent will continue to face major development challenges in 2007. I briefly review these development challenges. 1. The Darfur crisis in Western Sudan will remain a major barometer of Africa's capacity to resolve continental problems. A successful resolution of the genocide in Darfur has so far eluded the African Union and powerful continental leaders. The crisis has also eluded the effort of the United Nations Security Council, the Bush administration and the troubleshooting missions of various well-meaning personalities. The focus is now on the next moves of the Democratic-controlled Congress and the new secretary general of the United Nations. It is also likely that this year will herald a major breakthrough regarding a hybrid African Union-United Nations peacekeeping force for Darfur. 2. The African Union Commission based in Addis Ababa, Ethiopia, will go through a delicate leadership transition. The current chairperson of the commission, Alpha Konare of Mali, is reportedly not seeking a second term. Over the last four years, the commission has emerged as the major platform for coordinating political and development issues in the continent. The commission is actively engaged with the European Union, the United Nations, and the Group of 8 nations. African leaders face the challenge of selecting a new leader for the commission who must speed up regional integration; accelerate policy and program coordination with other continental institutions such as the African Development Bank, the United Nations Economic Commission for Africa, and the World Health Organization Regional Office for Africa; establish a strong peacekeeping apparatus and stand-by force; accelerate the implementation of a continental court of justice and a continental financial and monetary institution; and coordinate the fight against infectious diseases in the continent. The new leader will also manage the delicate and sensitive integration of the continent's development platform, the New Partnership for Africa's Development, into the mainstream activities of the African Union Commission in accordance with an earlier decision of Africa's heads of state and government. 3. Some key African nations face critical political transitions in 2007. Nigeria is scheduled to hold national elections in April to replace its term-limited president, Olusegun Obasanjo. This election is critical as hitherto political allies have parted ways and at least two major political opposition parties appear poised to give the ruling party a run for the presidency. The same situation is applicable in Kenya where the president, Mwai Kibaki, has parted ways with many of his prominent allies who are now poised to provide stiff opposition in the scheduled general election. Sierra Leone, a major success story in post conflict transition, is facing a tough general election cycle. President Ahmad Tejan Kabbah is term-limited and the contest for the presidency is wide open. President Thabo Mbeki of South Africa is scheduled to relinquish the powerful presidency of the African National Congress, the ruling party, by the end of the year. It is widely believed that whoever becomes the president of the ruling party is likely to have the inside track to the presidency of South Africa when Thabo Mbeki's term ends in 2009. The campaign for the presidency of the ruling party is likely to pit the charismatic former deputy president of the republic, Jacob Zuma, who was removed by Mbeki, with a probable nominee of the president's. In Egypt, the President Hosni Mubarak is 79 years old and the need for a political transition to a younger generation could begin this year. The president's 44-year-old son, Gamal, is reportedly a frontrunner. 4. Conflicts in Africa will likely continue to be a problem. The Niger Delta conflict between militants and Nigerian government forces will continue throughout the year until a political solution is reached regarding the pent up feelings of the delta's impoverished inhabitants. The conflict in Somalia, despite the routing of the Islamic fundamentalists, may snowball into ethnic warfare and guerrilla insurgency if the victorious transitional government does not consolidate power through good governance, and if Ethiopian troops in Somalia remain for extended periods. The effective partition of Ivory Coast into north and south will likely continue until a new presidential election is organized under the auspices of the United Nations and the African Union. The unrest in Guinea may spiral out of control if its ailing president dies. The Democratic Republic of the Congo will continue to make progress regarding its delicate post-conflict and participatory democracy transition. However, occasional outbursts of violence may occur as warlords adjust to their new status. Liberia will likely continue the consolidation of peace and reconciliation after its devastating civil war. However, President Ellen Johnson Sirleaf will come under increasing scrutiny regarding the provision of basic infrastructure and the reintegration of ex-combatants and returned refugees into mainstream Liberian society. Northern Uganda (despite the ongoing peace process), the Eritrea-Ethiopia border, the Central African Republic, Chad and Burkina Faso could become flash points of conflict due to unresolved political issues. 5. China will expand its partnership with African countries. China will push to increase its trade with African countries, worth more than $40 billion in 2005 after growth rates of more than 50 percent in 2003 and 2004. China will likely expand its development assistance to Africa. In 2006, at a meeting with African leaders in Beijing, China pledged to double its economic assistance to Africa and provide $3 billion in soft loans and $2 billion in export credit within three years. China also announced a plan to train 15,000 African professionals and to establish a development financing fund for school and hospital construction projects. The major focus of China's economic diplomacy in the continent will continue to be in African countries with extractive resources as it seeks to manage the explosive growth in domestic energy utilization. China is also likely to accelerate its cooperative agreements with poorer African countries such as Zambia by investing in major national industries and jumpstarting small and medium enterprises. The burgeoning China-Africa partnership will continue to engage the attention of the human rights community, which believes that China should use its leverage to improve human rights practices in its African trading countries. 6. 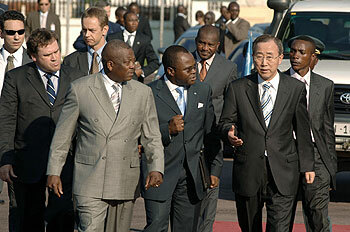 The United Nations system will come under increased pressure to assist Africa. With the chiefs of both the United Nations and W.H.O. on record as having a principal focus on Africa, it is likely that a more coordinated and a simplified implementation strategy by various specialized United nations agencies in Africa will be in the offing. The appointment of Tanzania's former foreign minister, Asha-Rose Migiro, as the United Nations deputy secretary general will likely lead to a push for a more coordinated development assistance to Africa. Ongoing efforts on closer cooperation by regional institutions in Africa will also expedite coordination initiatives in the continent. 7. Health policy and programs in Africa will become better coordinated and managed. The African heads of state at the summit on "Universal Access to H.I.V./AIDS, Tuberculosis, and Malaria Services" last year in Abuja, Nigeria, mandated the African Union to develop an implementation plan for monitoring progress in member states. The W.H.O. Regional Office in Africa released a landmark publication last year on health issues in Africa, with a roadmap for policy and program action. Regional institutions are likely to work together toward developing continental guidelines on policy and program initiatives for infectious diseases. At country levels, primary health care systems are making a major comeback after nearly two decades of neglect. The emerging primary health care systems are building upon lessons learned from successful community-based treatment and preventive programs in resource-challenged environments. The new model seeks to integrate clinical, preventive, and rehabilitative services. In addition, countries in Africa are more likely to realign their national strategies in response to the continental initiative to achieve universal access to integrated H.I.V./AIDS, TB, and malaria services. This alignment will include renewed emphasis on policy development, program monitoring and evaluation, and disease surveillance. On a negative note, it is highly unlikely that the issue of acute shortage of trained health personnel in Africa will receive serious attention at continental or international levels. Part of the problem is cost. The W.H.O. estimates that the United States' share of a global initiative to train and support a health workforce that meets established targets in Africa is about $8 billion over five years. Another problem is the lack of a continental policy and program framework for action. Furthermore, no consensus exists on the best strategy for tapping into the expertise of the thousands of African diaspora expertise in healthcare for specific health programs in Africa. Another lingering health concern is whether the continent will be ready for a robust response to an outbreak of bird flu in humans. The jury is still out. If a bird flu epidemic occurs in the human population, many African countries will be hard pressed to mount a robust response in 2007 due to technical, financial, logistic, and outreach difficulties. 8. African leaders will insist on redeeming past pledges of development assistance by bilateral and multilateral organizations. It is likely that African leaders will have a strategic focus on the need to redeem past pledges by bilateral and multilateral institutions regarding development assistance to the continent. African leaders are likely to focus on redeeming pledges made regarding debt relief; the Group of 8 nations' planned doubling of aid by 2010 and universal access to H.I.V./AIDS preventive, treatment, and support services; a fair trade deal that addresses agricultural subsidies and access to market issues in Western countries; and an arms trade treaty. International bilateral and multilateral pledges on education, childhood immunization, malaria control, and other tropical diseases will also come under scrutiny. 9. Small- and medium-scale enterprises will likely receive major attention from policy makers. The World Bank estimates that small- and medium-scale enterprises in Africa account for more than 90 percent of private business in the continent and employ more than 50 percent of the entire workforce. The continued anemic economic growth in many African countries and the inconsistency of foreign development assistance will drive a more aggressive push for enabling policy and program environments that promote small and medium enterprises. This year, governments in Africa are likely to build upon gains of the recent past on creating enabling regulatory policy frameworks for the private sector, including incentives for private investors. The burgeoning stock exchanges in Africa are also indicators of African governments' keenness to attract and deploy capital for indigenous private investors and the private sector. Recent reports by the World Bank and the Center for Global Development indicate that various African countries have reformed their economic regulatory frameworks, removed barriers to starting and maintaining a business, and established stable, macroeconomic environments. A major lingering question is whether African immigrants living outside the continent who send back billions of dollars in remittances (about $7 billion in 2006, according to the World Bank) will shift their focus to investments in the private sector. The smart money is that these immigrants will continue to hold back from entrepreneurial activities until various political transitions are completed and macroeconomic stability appears to be long term. 10. International philanthropic organizations and wealthy Africans will begin to focus on public/private/civil society initiatives to address specific development issues in the continent. The Sudanese multi-millionaire entrepreneur, Mohamed Ibrahim has set the ball rolling with the creation of a $5 million annual award for the African leader that provides exemplary leadership. The Gates Foundation popularized the concept of an international development alliance focused on solving specific issues through concerted public/private/civil society action and anchored on long-term financial support. It is likely that these alliances and initiatives will become very important in Africa in 2007. An Africa-dedicated H.I.V./AIDS, TB, and malaria international alliance or initiative could become a reality to address all political, technical, logistic, and community mobilization impediments to achieving universal access to remedial efforts. Other important alliances and initiatives may include those dealing with AIDS orphans, free primary school, girl's education, women's microcredit facilities, and legal protection for vulnerable populations. Africa is the only continent where the number of people living on less than one dollar a day increased from about 160 million 25 years ago to 300 million in 2006. It is also a continent in transition, with political plurality on the increase, a growing number of governments that have created enabling environments for private enterprises, and the emergence of civil society organizations as watchdogs of public and private policies and actions. It is likely that in 2007 Africa will continue to build upon the gains of the last few years, as the continent navigates delicate political transitions in key countries and as it moves to strengthen the capacity of regional institutions and national governments to create better opportunities for Africans to realize their dreams.